In Spring 2015, an advertising campaign ran in Britain for a weight-loss drink, which featured an arresting image of a bikini-clad model along with the tagline, ‘Are you beach body ready?’ Objectification concerns were immediately raised, along with others regarding the ‘monetising’ of women’s vulnerabilities. But the pushback didn’t just come from feminist quarters. For some, that a manufacturer of slimming products could attempt a re-imagining of beaches – a space hitherto enjoyed by the young, old, lithe and out-of-shape alike – was unconscionable. Where was the protection from this trend? Who was trying to stop it? Another topic raising questions far deeper than the surface problem, is the slow death of libraries. The writer Matt Haig tweeted that ‘libraries aren’t just about books. They are almost the only public space we have left which don’t like our wallets more than us.’ But how does one register that on an accountant’s spreadsheet? And even more fundamentally, why is that bottom line so damn important? The two issues bring to the fore the same, vexing concerns: about cultural trends and the direction of their drift; about the things we value, and whether they’re always quantifiable. And, ultimately, about the nature of progress – who defines it, who gets included in the debate, and what happens to those left out? Jeffreys’ aim is to slow the pace right down and connect with people, places, animals – the very soil that will soon make way for a train hurtling along at 400km/h. I have no idea where booksellers will place Signal Failure – it’s political, reportage, travelogue, delving deeply into nature and the environment, part memoir and laced throughout with extempore musings. I hope it doesn’t fall between the cracks. It’s very, very special. Tom Jeffreys is a writer, editor and occasional curator with a particular interest in contemporary art that crosses over into the sciences or explores our relationship with the environment. His work has been published in, among others, Monocle, Apollo, Vice, The Independent, The Daily Telegraph, New Scientist, Cricinfo, and World of Interiors. Previous curatorial projects have included poet-led urban nature walks and exhibitions dedicated to the beauty of the mundane and the role of archives in our understanding of the natural world. Tom is also editor of The Learned Pig, an online magazine with four areas of interest: art, thinking, nature, writing. Signal Failure is published by Influx Press. Author bio courtesy of the same. 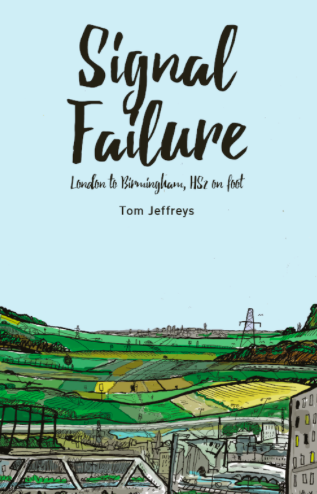 Posted in Book reviews and tagged HS2, Signal Failure, Tom Jeffreys. Bookmark the permalink.